The overall health of Blackburn Bay deteriorated slightly in 2016. Chlorophyll a increased significantly with the mean value increasing to 0.0108 mg/l, exceeding the threshold value. Nitrogen concentration also increased remaining in the “Good” range, between target and threshold levels. The mean value for phosphorus concentration increased only very slightly, and is still well below the target. Water Quality: While two of the three water quality indicators ( nitrogen, and phosphorus) were rated as pass, chlorophyll a's rating changed from “Good” to “Caution” because of its continued increase in value. The mean for chlorophyll a was calculated as an arithmetic mean and the means for nitrogen and phosphorus were calculated as geometric means (per the Numeric Nutrient Criteria outlined in the Florida Administrative Code, section 62-302.532). The mean chlorophyll a level was 0.0108 mg/l, exceeding the threshold concentration of 0.0082 mg/l . The mean nitrogen level increased to 0.4276 mg/l, exceeding the target value of 0.36 mg/l. Phosphorus concentrations in the bay showed an increase as well, with a mean in 2016 of 0.0821 mg/l, well below the target (0.170 mg/l) and threshold (0.210 mg/l) levels and earning a score of “Excellent”. Biotic Indicator: Measurement of the biotic indicator, seagrass, was performed in 2016 by the Southwest Florida Water Management District. 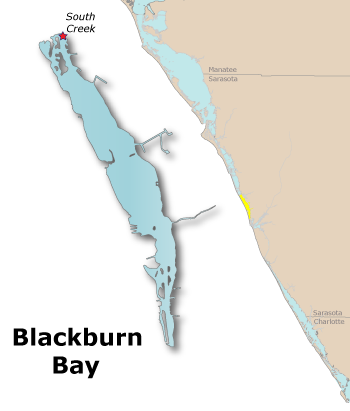 Total seagrass acreage in Blackburn Bay was measured to be 314 acres, a decrease in coverage from 344 acres in 2014. Seagrass acreage remains below the target level of 447 acres.